Last of The Summer Wine Collectors Spoons, each spoon is silver plated and comes in a protective box. Perfect for a gift or if your a keep collector then it is a must have! 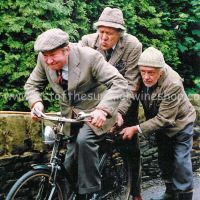 Clegg on bike with Seymour & Compo pushing!